Our Children's Church (CC) takes place after our 10am Sunday worship time ends. We have 3 “age group” classes available - Newborn to 3 (in our Nursery room), ages 4-7 (in the younger kid’s CC room), and ages 8-12 (in the fellowship Hall). Dawn Sheffield directs the CC Ministry, with Asst. Director Sandy Corriero. Our Sunday meetings include special videos, bible teachings, games, and a snack time! (Gluten and allergy free healthy snacks available!) We also take time to pray for our children and their families regularly. 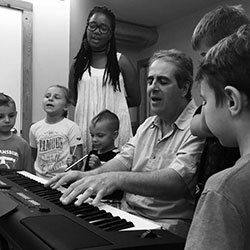 And there are special times of worship & music instruction, led by Brother Joe Salzano, several times a year. In addition we have special events for our kids during the year - including quarterly crafts Sundays, puppet shows, an October “Harvest Fun Day”, and Easter time (and/or) Christmas time pageants & plays. We welcome families to Agape, and encourage parents to bring their children to become part of our Children's Church!